Heavyweight children's author Robert Munsch is the favorite to win top children's hockey book billing in 2008, but there is some notable competition. 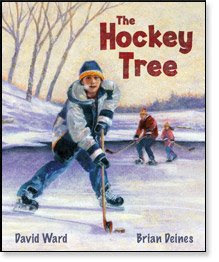 I especially like The Hockey Tree by David Ward with illustrations by Brian Deines. It is published by Scholastic. It's a great story about a family outing playing hockey on a frozen pond. With Humboldt Lake finally frozen over, Owen and his sister Holly can’t wait to get down to the lake for a day of hockey. They race back and forth with their dad, passing and shooting, enjoying the great Canadian game. But then they lose their puck into an ice fisherman's hole! Owen and Holly are dejected that their day of hockey has come to an early end. But the game isn’t over yet. Dad has a plan. But they have to find the perfect hockey tree. I won't spoil the plan, because I thought it was a real ingenious idea. Perhaps the folks out on the frozen plains of Saskatchewan know all about such hockey trees, but for this west coaster I had never heard of such a brilliant idea. And while the story is simple and nostalgic, Brian Dienes soft illustrations really create the perfect atmosphere for the book. Readers of all ages will appreciate Dienes' work. This 32 page book is actually the paperback release of the 2006 original book. It is a highly acclaimed title, winning such accolades as Resource Links Best Of The Year 2006, Shining Willow Award 2007 and OLA Best Bets 2007. It was also nominated for the Chocolate Lily Award in 2008. If you have a youngster in your life, The Hockey Tree would be a great addition to his or her library. The book is listed as aimed at 4 to 8 year-olds.